In one of the most comprehensive multi-observatory galaxy surveys yet, astronomers find that galaxies like our Milky Way underwent a stellar "baby boom," churning out stars at a prodigious rate, about 30 times faster than today. Our sun, however, is a late "boomer." The Milky Way's star-birthing frenzy peaked 10 billion years ago, but our sun was late for the party, not forming until roughly 5 billion years ago. By that time the star formation rate in our galaxy had plunged to a trickle. Missing the party, however, may not have been so bad. The sun's late appearance may actually have fostered the growth of our solar system's planets. Elements heavier than hydrogen and helium were more abundant later in the star-forming boom as more massive stars ended their lives early and enriched the galaxy with material that served as the building blocks of planets and even life on Earth. The image above is an artist's view of night sky from a hypothetical planet within a young Milky Way-like galaxy 10 billion years ago, the sky are ablaze with star birth. Pink clouds of gas harbor newborn stars, and bluish-white, young star clusters litter the landscape. Astronomers don't have baby pictures of our Milky Way's formative years to trace the history of stellar growth so they studied galaxies similar in mass to our Milky Way, found in deep surveys of the universe. The farther into the universe astronomers look, the further back in time they are seeing, because starlight from long ago is just arriving at Earth now. From those surveys, stretching back in time more than 10 billion years, researchers assembled an album of images containing nearly 2,000 snapshots of Milky Way-like galaxies. The new census provides the most complete picture yet of how galaxies like the Milky Way grew over the past 10 billion years into today's majestic spiral galaxies. The multi-wavelength study spans ultraviolet to far-infrared light, combining observations from NASA's Hubble and Spitzer space telescopes, the European Space Agency's Herschel Space Observatory, and ground-based telescopes, including the Magellan Baade Telescope at the Las Campanas Observatory in Chile. 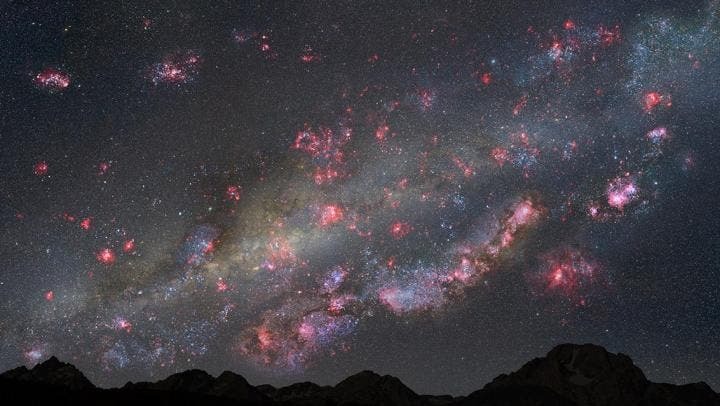 "This study allows us to see what the Milky Way may have looked like in the past," said Casey Papovich of Texas A&M University in College Station, lead author on the paper that describes the study's results. "It shows that these galaxies underwent a big change in the mass of its stars over the past 10 billion years, bulking up by a factor of 10, which confirms theories about their growth. And most of that stellar-mass growth happened within the first 5 billion years of their birth." The study reveals a strong correlation between the galaxies' star formation and growth in stellar mass. So, when the galaxies slow down making stars, their growth decreases as well. "I think the evidence suggests that we can account for the majority of the buildup of a Milky Way-like galaxy through its star formation," Papovich said. "When we calculate the star-formation rate of a Milky Way-like galaxy in the past and add up all the stars it would have produced, it is pretty consistent with the mass growth we expected. To me, that means we're able to understand the growth of the 'average' galaxy with the mass of a Milky Way galaxy." Infant Galaxy Clusters –"May Reveal Role of Dark Matter in Shaping the Universe"